Fri, Feb 8, 2019, 12:50 pm SL Time, ColomboPage News Desk, Sri Lanka. Feb 08, Colombo: Dr. Roberto Lenton, one of the world's foremost experts in water management is in Sri Lanka this week for high-level government consultations. Dr. Lenton has just been appointed to chair the Board of Governors of the International Water Management Institute (IWMI), which is a CGIAR Research Centre and has the distinction of being the only international institution headquartered in the country. Working globally to achieve water security, IWMI pursues a wide range of collaborative initiatives with diverse Sri Lankan partner organizations - addressing issues that include better management of wetlands for climate-resilient, sustainable development, tank cascade rehabilitation process, drought and flood monitoring for improved disaster management, more efficient irrigation management using ICT for stronger food security, and green solutions for safe wastewater management. 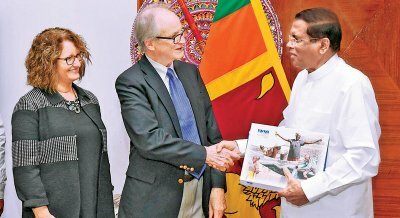 During his visit, Dr. Lenton met with President Maithripala Sirisena and Foreign Affairs Minister Thilak Marapana. "I look forward to stimulating and productive discussions with leaders of IWMI's host government and to identifying new ways in which we can work together for stronger water security, which is a lynchpin of Sri Lanka's food security and sustainable growth as well its resilience in the face of climate change impacts," said Dr. Lenton. "I have many cherished memories of my earlier work in this country and am happy to hold a new position that enables to be of service once again." Dr. Lenton played a key role in IWMI's establishment in 1984, served as its Director General from 1987 to 1994, and helped bring the Institute into the CGIAR System during 1991 as part of a wider effort to mainstream sustainability in the system's research. Subsequently, he held several other senior positions, including director of the Sustainable Energy and Environment Division at the United Nations Development Programme (UNDP); Chair of the Inspection Panel of the World Bank; and Founding Executive Director of the Daugherty Water for Food Global Institute at the University of Nebraska. Working globally to achieve water security, IWMI pursues a wide range of collaborative initiatives with diverse Sri Lankan partner organizations - addressing issues that include better management of wetlands for climate-resilient, sustainable development; tank cascade rehabilitation process, drought and flood monitoring for improved disaster management; more efficient irrigation management using ICT for stronger food security; and green solutions for safe wastewater management.